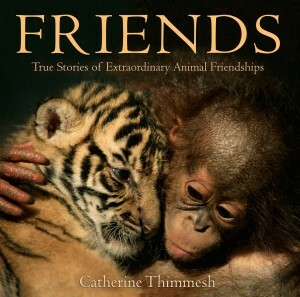 Unlikely animal friendships has been a popular theme on Vegbooks, as can be seen with the reviews of Owen and Mzee, Tarra and Bella and Dogs Have the Strangest Friends. Author Catherine Thimmesh brings another compilation to this burgeoning genre with Friends: True Stories of Extraordinary Animal Friendships. who picks up the slack. when sadness takes hold. Below each poem, older readers will find a detailed paragraph explaining the pair’s history and how it attests to the subject of friendship. This is a sweet and sincere book with beautiful photography and many applications – as a lesson on character building, tolerance and kinship; a novel gift to a friend; or a coffee table addition for guests to peruse.